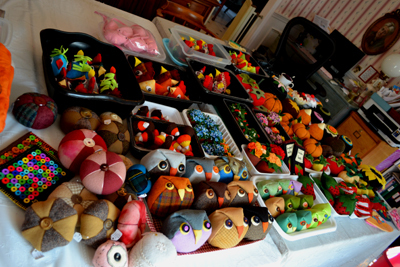 Owls are the new pincushion for this season, big or small. Here is a sneak peak of what has been created for this fun event. Jane has deemed it "the year of the owl"...something about gaining wisdom and sewing pincushions and felted wool items part of the year while she spends the other part of the year creating quilts, an art form that she is pursuing once again! 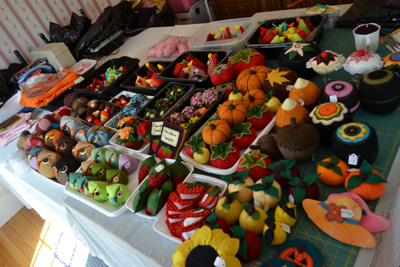 Jane has created her many other designer pincushions that she is famous for as well: various fruits and vegetables, chickens, candy corn, ice cream sundaes, flower pots and strawberry pots, penny rug, and two tones button pincushions as well as button coin purses, and needle books. If you don't sew, it doesn't matter as these felted wool sculptures add much color to whatever space you want to decorate. They also make affordable and unusual gifts for discerning friends. Once Jane gets started working with felted wool she cannot stop however, and so she has created all sorts of various items for Maria's art show as well as two other holiday sales in November and December! She hasn't stopped sewing in weeks...except for naps and snacks!! Her family hasn't seen much of her either. I can't seem to stop creating felted wool items, simple but colorful! 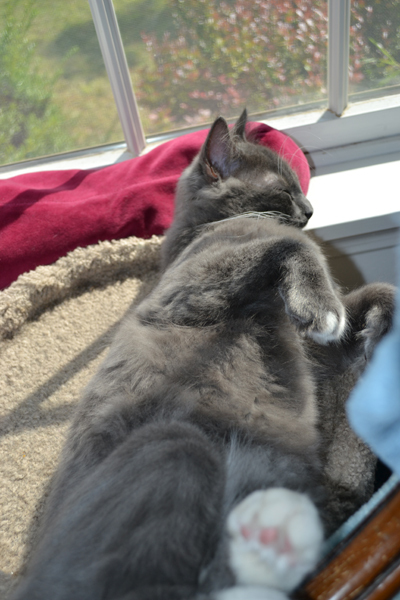 Her tiny kitty has grown up suddenly and is going a bit bizerk trying to convince her to take a break to play with him...He may be a large cat now, but he is still a kitty at heart! My Addie Rose is really Addie Roe and has grown to be a very big boy! *Jane will be only one of the many artists featured at this event. See Maria Wulf's blog at http://www.fullmoonfiberart.com/events/ for more details about this event. Many artists, belly dancers, poetry readings, art demonstrations, as well as Jon's dog Red, herding their flock of sheep will be there to entertain all who come. Jon will share the details of sheep herding and also talk about their dogs and their ways of serving their community. Jon Katz is a New York Times Best Selling Author and their show will include some of his books and prints of his photos that you can purchase and have autographed while you are there! Please feel free to stop by and take in this fun fall event! 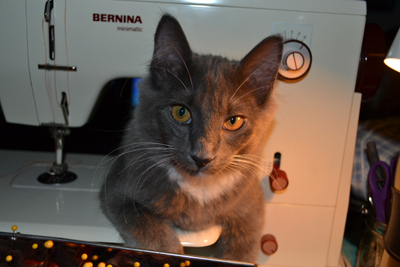 He is my sewing buddy for sure and tries to get into the action quite literally!